The only needlework getting done around here lately has been crocheting a few rows each evening on Mary's wedding gift afghan. We've been trying to squeeze every last bit of summer into these few days before school starts again. 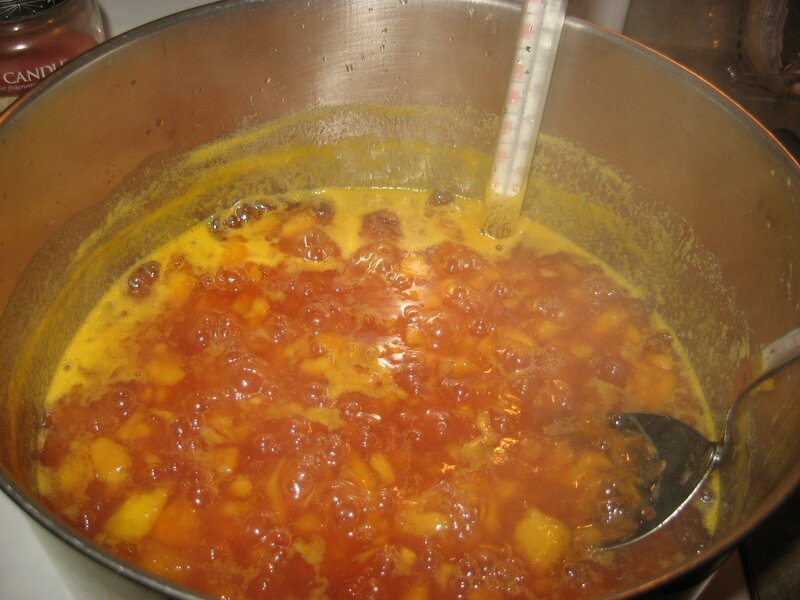 I had a list of things I wanted to get done over the summer while I was out of school, and making peach jam was one of them. For the past week or so, I've been harassing the friendly workers at our local Gove Farm for some of their peach seconds, which are just as delicious as their first quality peaches but with a few bumps and bruises on them. Finally yesterday I struck gold! 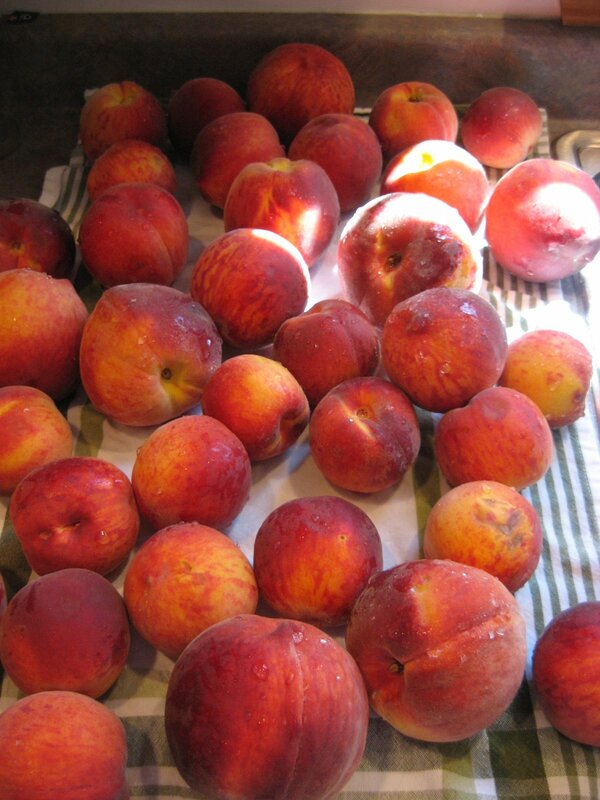 A fifteen pound box of the most beautiful peach seconds for $8.50! If I had not been pressed for time, I would have bought two boxes, but one would have to do. First I gave them a little rinse off in the sink. Not that they really needed it since they were so fresh and yummy looking! I do believe they had just been picked a few hours before I bought them! 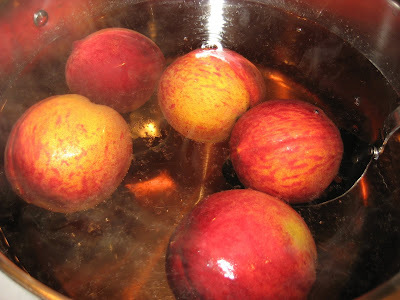 ...and then I slipped the skins right off the peaches, leaving luscious, juicy, naked peaches! It was so hard to resist just gobbling them up at this point! After removing the pits, I roughly chopped them up and measured out 10 cups for the recipe. 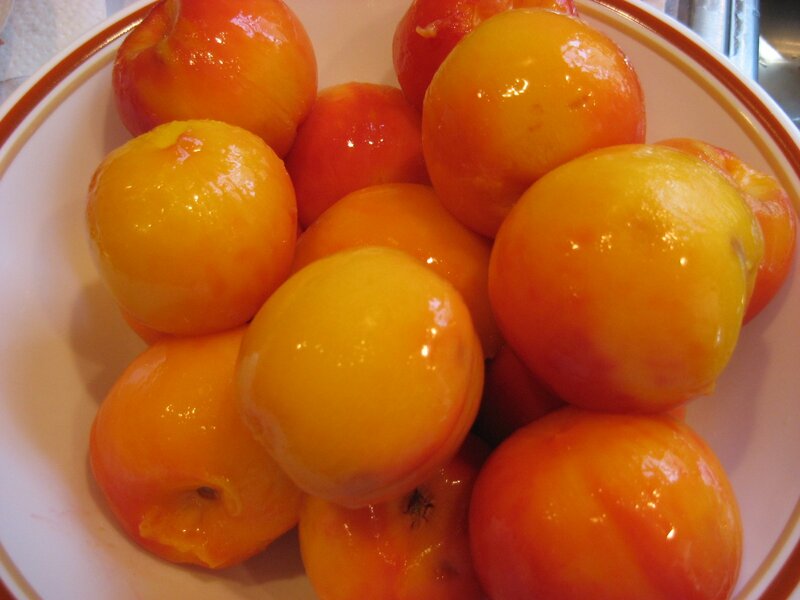 The rest of the peaches also got chopped up and measured into freezer bags and mixed with lemon juice, labeled and put in the freezer for later use. I have enough in the freezer for another batch of jam, so another 10 cups, plus another bag with 4 cups in it which I will probably use for smoothies or a small cobbler or muffins or something else yummy. 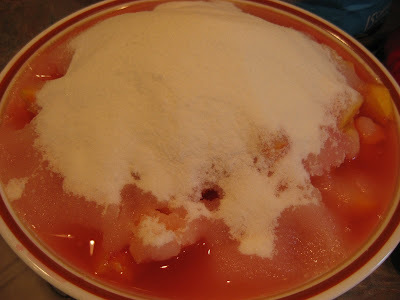 The first 10 cups got dumped into a big bowl and mixed with the lemon juice and sugar called for in the recipe. Then it just sat there getting juicier and juicier while I finished chopping the rest of the peaches. I had to transfer it to a bigger bowl so the juice wouldn't overflow the bowl! ...but almost an hour later, my candy thermometer finally reached 220 which is the appropriate temperature for a good jelly consistency at my sea level! You can see that most of the water has cooked out of the mixture, leaving just the luscious flavor of peaches and the sweetness of the sugar. 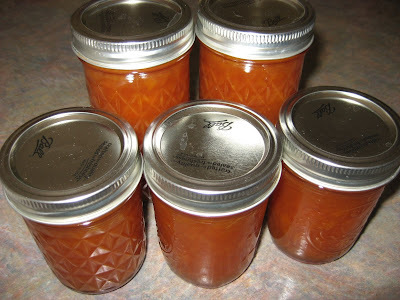 I ladled the hot peach jam into hot canning jars and topped them with hot lids for a good seal. I turned them upside down for a few minutes to sterilize the lids, then right side up to cool. I love listening to the lovely tink sound of the lids when they finally seal shut! This batch yielded two 12 ounce jars, three 8 ounce jars and about 4 ounces in another jar which I just put in my refrigerator once it had cooled, for us to enjoy. 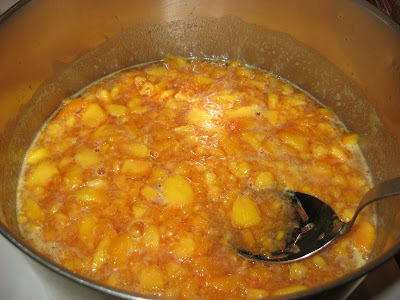 It was delicious this morning, and the consistency of it was perfect for fresh peach jam! 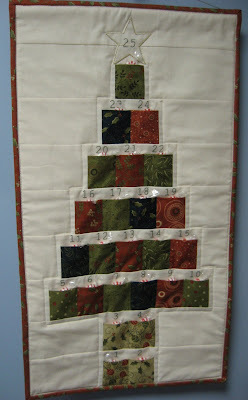 This whole process took me about three hours from beginning to end and was worth every minute of it! 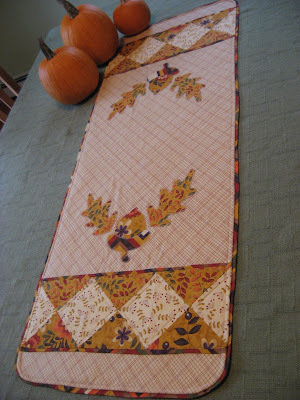 Are you doing any canning or jam making to preserve a little taste of summer to enjoy when the cold winter comes? 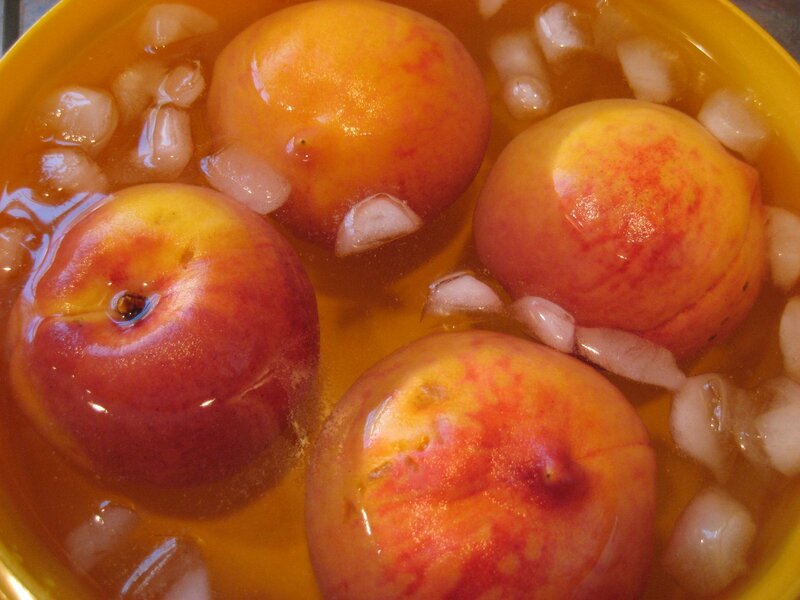 How yummy - I can remember my mother canning crates and crates of peaches - they were so delicious. 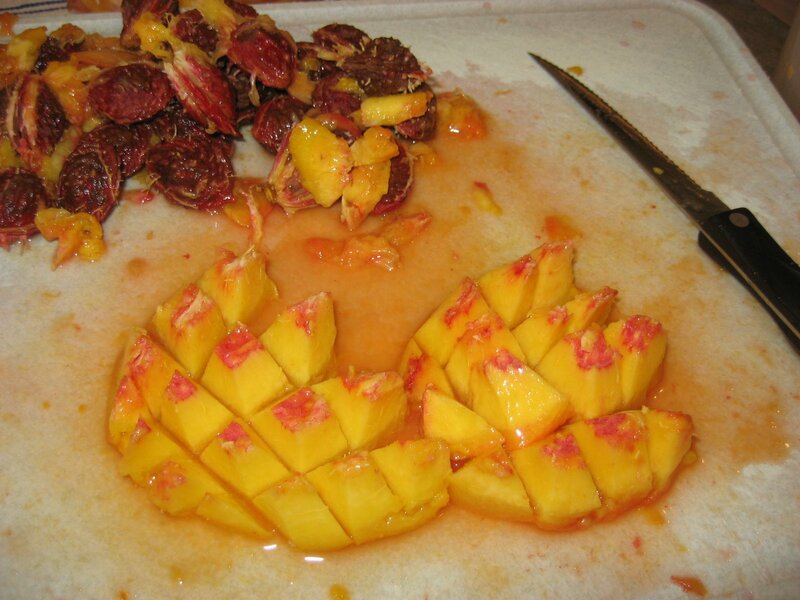 Peaches are my favorite. My FIL was telling me good the peaches are in the PA area this year. Too bad I'm not due for a visit or I would have to make some of this yummy peach jam. You're a better woman than I am! I just cannot stand the thought of standing over a boiling water bath in the hottest month of the year. I try not to eat sweets anyway. I plan on roasting the tomatoes, at least the oven is insulated. The peach jam looks absolutely lovely, especially as I am not making it!! Kool-aid Dyed Cotton Yarn ~ Finished!